Belarus has one of the oldest governments among all of the post-Soviet nations. The average age of the high level state officials has reached 56 years. The average age of the Council of Minister’s members alone equals 55 years. This is 6-8 years higher than in Russia and Ukraine and about 20 years higher than in some advanced post-Soviet reformist governments. The average age of the most senior officials in Belarus also becomes higher than in the neighbouring states. As the majority of the high-ranking officials, who have been in top positions for the last 10-15 years get older the average age grows. With some exceptions, instances of young officials joining the top governing elite remain rare. This raises serious concerns about how Belarus could go through the challenges of the declared economic modernisation. How Old Are Belarusian Top Level Officials? This table prepared by Belarus Digest shows the years of birth and current age of the high-ranking Belarusian officials. The table does not rank the officials in accordance with their formal or informal roles in the political process. Their placement in the table is quite random but it makes the age point quite clearly. The average high-ranking Belarusian official was born in 1956 and his/her age today reaches 56 years. This nearly equals Alexander Lukashenka’s age. And the average member of the government (the Council of Ministers) is just one year younger – 55. The oldest persons in the Belarusian political hierarchy remain the Speaker of the parliament’s upper house Anatol Rubinau, Chairman of the Supreme Court Valyancin Sukala and Deputy Prime Minister Piotr Prakapovich. They have reached the age of 70. The youngest one, Andrei Shorets (40 years old), heads the Ministry of Housing and Utilities. Comparisons with other former Soviet states reveal that the Belarusian governing elite becomes more senior than the region’s average. For example, the average age of the members of the Russian government stays at 49 years. However, if we add the other top-ranking officials (to make it comparable with the entire Belarusian list) then the average age of the Russian leadership goes up to 56 years, which looks the same as in Belarus. 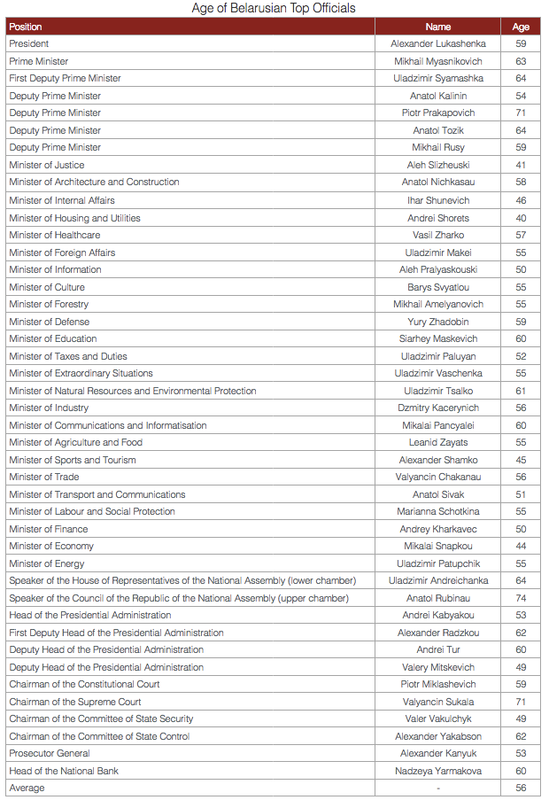 The average age of the Ukrainian Cabinet of Ministers (as of December 2012) equals 47 years. The government of Kyrgyzstan – 53 and the government of Kazakhstan – 49. Comparing the age of the most senior state officials in Belarus and the neighbouring countries also shows that Belarusian top officials are rather old. Gerontocratic Rulers Incapable of Reform? Can we call the present-day Belarusian government and ruing elite in general a gerontocracy? Perhaps, not yet. This despite the fact that the average age of the top-ranking officials significantly exceeds the average age of the Belarusian population. According to the 2009 census, the latter equals 39.5 years old. While the top Belarusian officials get older the majority of the public servants stay in their 30s and 40s. According to the Belarusian statistics agency, as of the beginning of 2013, 53,7% of all state officials were born between 1963 and 1983. And only 11.2% of them have already reached the pension age. However, the latter have far better positions in the decision-making system. And here one more aspect seems crucial to this discussion: intuitively, the age of the high-ranking officials has to impact their ability to think and act innovatively. In particular, the ability to design and carry out effective systemic and sectoral reforms that Belarus definitely needs. This seems particularly topical in the framework of the declared modernisation plans. The examples of such reformers as Estonia in the 1990s or Georgia in the 2000s suggest that the younger the government the more likely it is to achieve groundbreaking results in modernising a country. The average age of the Estonian post-Soviet government that Prime Minister Mart Laar formed in September 1992 was slightly above 30. And the premier himself only celebrated his 32nd birthday. Mart Laar names the young age of his government as one of the factors of the successful reforms: “we did not know what was real and what was not and thanks to that managed to accomplish unreal results”. On the contrary, when the 71-year old Deputy Prime Minister of Belarus Piotr Prakapovich becomes responsible for the program of economic modernisation we can hardly have high hopes in him. Especially after his time as Chairperson of the National Bank and the financial turmoil of 2011 that followed Prakapovich's term at the National Bank. Overall, younger officials find it difficult to enter the highest echelons of power. Several factors could explain it. First, the Belarusian bureaucratic machine follows rather specific selection rules. Connections seem to be a core criterion. The interviews with public servants that the Liberal Club conducts within its studyon the public administration reform clearly confirm this. And the higher an official climbs the career ladder the more his/her age becomes important. The corporate logic does not normally welcome “wunderkinds”: one has to earn the right to get high. Second, top officials in Belarus are appointed by the authoritarian president rather than elected by a popular democratic vote. Regular elections only have to legitimise the leader's decision in the eyes of Belarusians and foreigners. And in this situation a long record of good and loyal service becomes more important than talent and competence. In addition, Lukashenka might find more psychological comfort working with the old cadres he knows well. As the saying goes, no one prefers to change horses in midstream. However, exceptions happen from time to time. The latest examples include the minister of utilities and housing Andei Shorets (40 years old) and the president’s economic affairs aide Kiryl Rudy (35 years old). Each such case becomes resonating news within the state apparatus and society at large. Moreover, there has been a lasting story of the so called "young wolves" in the government led by the president's oldest son Viktar Lukashenka. But no one knows when and if these "young wolves" manage to gain full control and whether they will still be young by that time. In the meantime, the old generation continue to rule the way they deem proper. They would love to preserve the political and socioeconomic status quo in the country and for that try to prevent any serious reform as long as they can. And even if the situation forces them to go for reforms one can hardly expect any innovative thinking there. Обновленная Европейская политика соседства: чего ждать Беларуси?